Photo: Carol Burch Brown. Design: Jessica Lily. 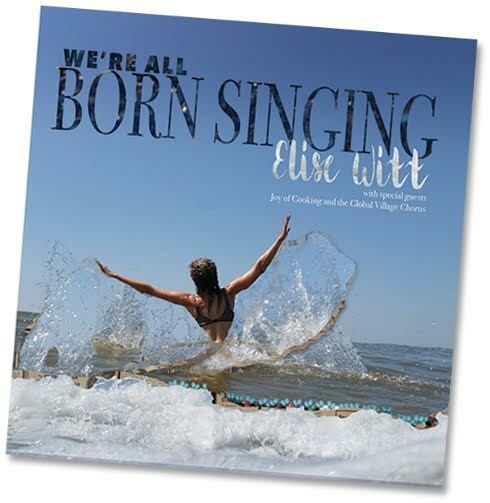 Longtime ROOTS member and winner of the William L. Womack Creative Arts Award, Elise Witt, is excited to announce the release of her newest recording project We’re All BORN SINGING. 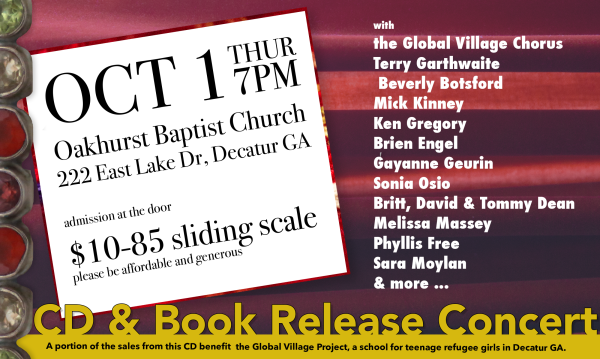 Join Elise and a host of fabulous musicians at her CD and Book Release Concert, Thursday, October 1 at Oakhurst Baptist Church in Decatur, GA (more information below). 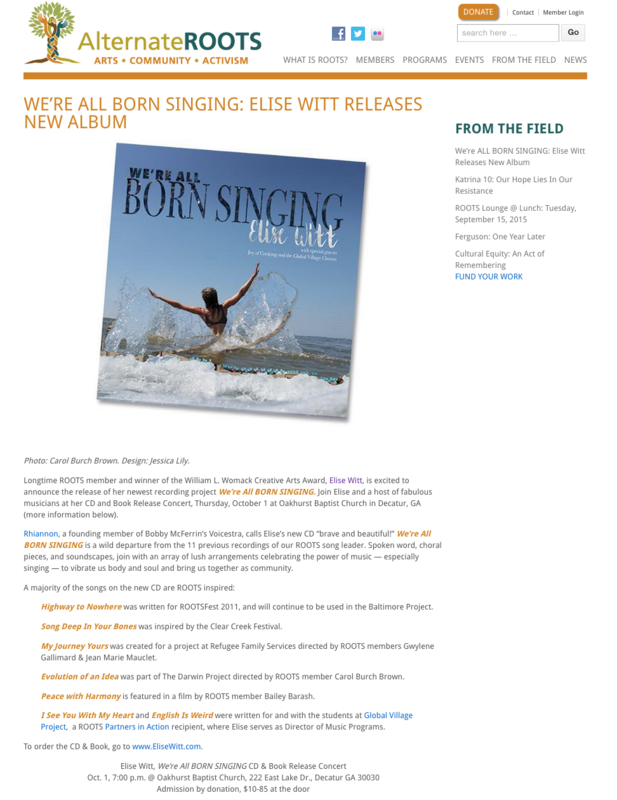 Rhiannon, a founding member of Bobby McFerrin’s Voicestra, calls Elise’s new CD “brave and beautiful!” We’re All BORN SINGING is a wild departure from the 11 previous recordings of our ROOTS song leader. 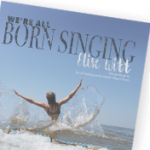 Spoken word, choral pieces, and soundscapes, join with an array of lush arrangements celebrating the power of music — especially singing — to vibrate us body and soul and bring us together as community. 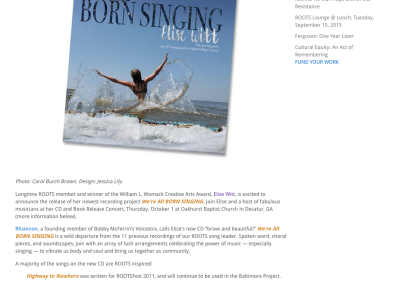 Highway to Nowhere was written for ROOTSFest 2011, and will continue to be used in the Baltimore Project. 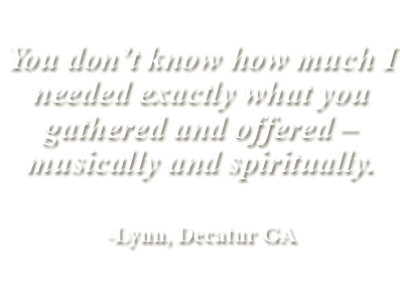 Song Deep In Your Bones was inspired by the Clear Creek Festival. 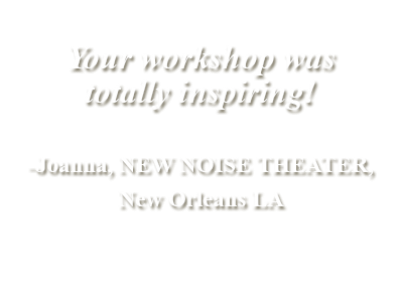 My Journey Yours was created for a project at Refugee Family Services directed by ROOTS members Gwylene Gallimard & Jean Marie Mauclet. Evolution of an Idea was part of The Darwin Project directed by ROOTS member Carol Burch Brown. 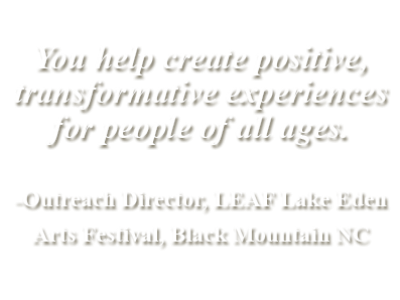 Peace with Harmony is featured in a film by ROOTS member Bailey Barash. 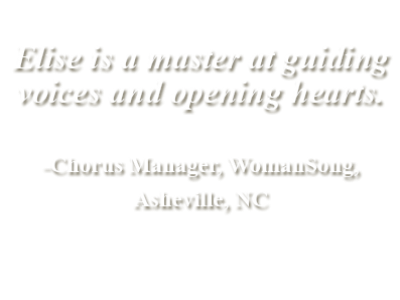 I See You With My Heart and English Is Weird were written for and with the students at Global Village Project, a ROOTS Partners in Action recipient, where Elise serves as Director of Music Programs. 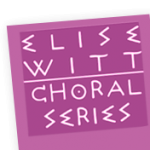 To order the CD & Book, go to www.EliseWitt.com.